It’s 100 degrees here in Portland. It was close to 100 on Saturday, it was 100 yesterday, it will be 100 today. I have no air conditioner. Usually I don’t miss it. There are only a couple of weeks every year that it’s useful. 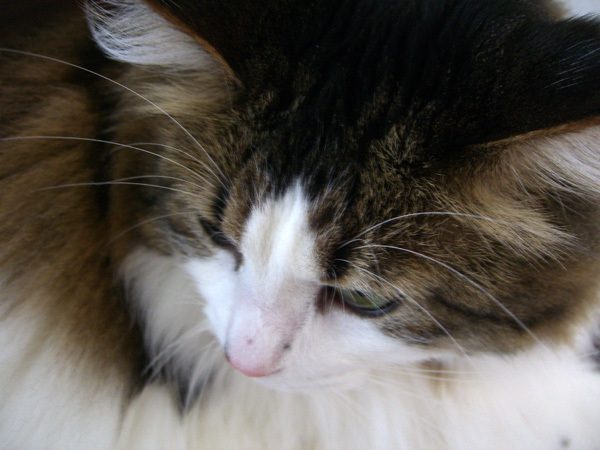 But, this is one of them. My house will stay cool for one day and part of another. But by the end of the second 100-degree day, my house is only marginally cooler inside than out. And then it takes a good solid week of lower-than-80-degree days to get cooled down. 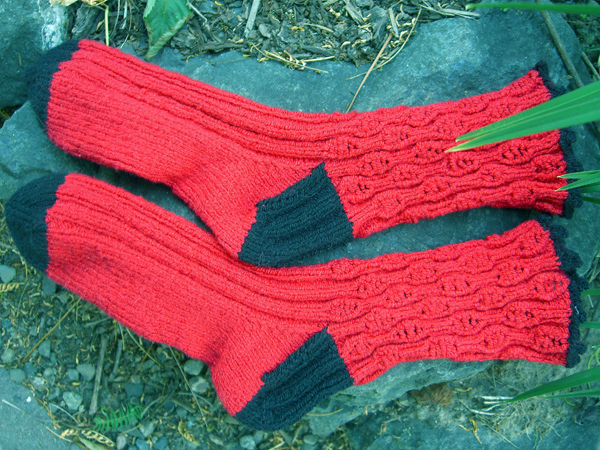 You can see that the red Fixation socks are finished. Cute, aren’t they? I’m really pleased with the way they came out. I hope that the intended recipient is as pleased! In the picture I show them baking in my back yard. At 9:00 PM, it was still 94. And that’s why I’m not knitting wool socks. The Rainbow stranded socks, to be specific. They are glaring balefully at me from inside my knitting bag. I had planned to take the Key West Sock Candy to Tangle on Saturday and wind it up. I forgot to put it in my bag. So what was I to do? Mysteriously, I found that some Sock Candy in Lapis had somehow wound itself into balls and fallen into my bag. Go figure. So I started a pair of socks in the Lapis last night. I’m barely up the toes so nothing to show yet. I love all of the Blue Moon yarns, but I think my stash is sufficiently enhanced now, and I must start to show some restraint when it starts calling to me from Tangle’s window. Look! My computer is speaking to me! I have the internets back! I have pictures! Ah… it’s the little things that make me happy. I won’t bore you, gentle reader, with the long and sordid tale of what it took to get this damn doorstop fine computer back amongst the living. Suffice it to say it’s been a long, slow, tortuous path. I lost a few things in one of the restores, but not things I can’t get back (I’m still hoping). Fortunately I keep my data on a drive separate from my operating system, and I back my data up religiously. The socks have progressed further than this now. Not a lot further because I just haven’t had nearly enough knitting time. But I’m a ways up the ankle now. I hope to get these wrapped up this weekend. Then the rainbow socks might have to still wait a bit while I try out some of that new Sock Candy. Yum! I was minding my own business yesterday, doing a little computer stuff and uploading some files to PI, when WinXP decided to download some updates. And when WinXP wants to download updates, it wants complete control and it doesn’t stop to ask please even if you tell it to. I’ve had this happen twice before (update download during upload to web), and both times XP has been damaged. This time my (nice, well-behaved, well-protected, working) computer has been turned in to a large doorstop. It’s a pretty, flashy, glowing doorstop, but a doorstop nonetheless. Yep, it’s deader than Marley’s ghost. Deader than a doornail. Dead. Try to boot: Cannot boot. System files corrupted or missing. In the end, I had to resort to reinstalling XP from scratch, which means I lost Windows knowledge of all of the software I have installed, some of which I need and use every day. Some of which gets me to the Internets. I tried something to “fix” it, and it’s gone back to being dead. No reason giving. Just won’t boot. So I will reinstall again. I have a backup that’s about 4 months old. It should be reasonably close. I haven’t done that many new things since then. So, reinstall again, and then restore, and then we’ll see. I tried to use #1 Son’s (newly working) computer last night to check my e-mail, and I couldn’t get to the web on his computer either. And I couldn’t figure out why, I tried and tried and tried everything I knew. I worked at it for 2 hours last night (e-mail is a powerful incentive). I could talk to the network router, but that’s as far as I could go. It was very mysterious. This morning I tried again. Still no go. Then I went back to my desk to get something and noticed that the modem wasn’t working. See, it’s powered through the battery backup that my computer is on. And I’d turned it off when I shut down the doorstop. That’s right, gentle reader, it does indeed work better if you plug it in. Three hours killed to learn that little lesson. Ah well. You will have to trust me when I say that the Fixation socks are coming along nicely, I’m almost ready to start working on the Rainbow socks again, and all that STR is yelling knit me, knit me. [sigh] Computer things seem to come in waves. Once I get past this, it should settle down for awhile again. Here’s hoping! First there were only whispers. Then sightings from friends of friends. Then the first-hand reports began to trickle in. Blue Moon is in at Tangle. So where do you think I was on Saturday? At Tangle, maybe? And remember that the rule is that sock yarn in no way counts as contributing to one’s stash. 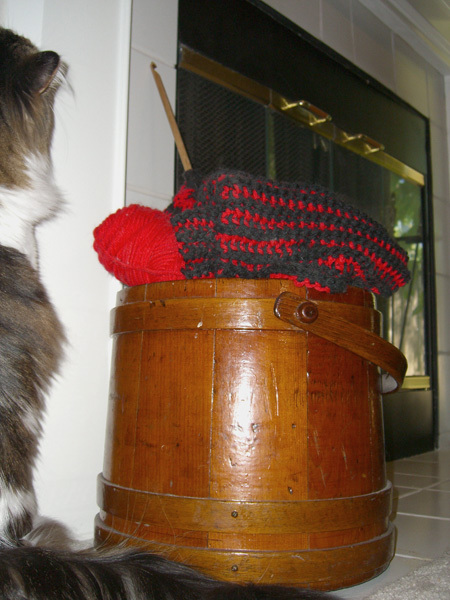 So just maybe some of that yarn mysteriously fell into my knitting bag and ended up at home with me. Left-to-right, that’s Sock Candy in Carbon, Socks That Rock in Stonewash, Mudslide, Jewel Of The Nile, Kryptonite and County Clare, and Sock Candy in Key West. I thought I showed admirable restraint. I didn’t buy any of the ribbon, or the kidmo, or the bamboo (that’s right, gentle readers, bamboo). Just the sock yarn. And it doesn’t count. I don’t have immediate plans for most of this. But I think the Key West will be next on my needles, after the two pair of socks already going. I’m also considering a fair isle pair using Stonewash and Mudslide. While I was there, D picked up some of the Jewel Of The Nile and wound it. My camera doesn’t do it justice. It is truly jewel-like and almost glows. I can’t wait to see it knit up. That’s the cool think about hand-painted yarns. They don’t look anything in the ball like they did in the skein. And they don’t look anything knit up like they did in the ball. It’s fun to see the colors emerge. I did get some knitting done, also. 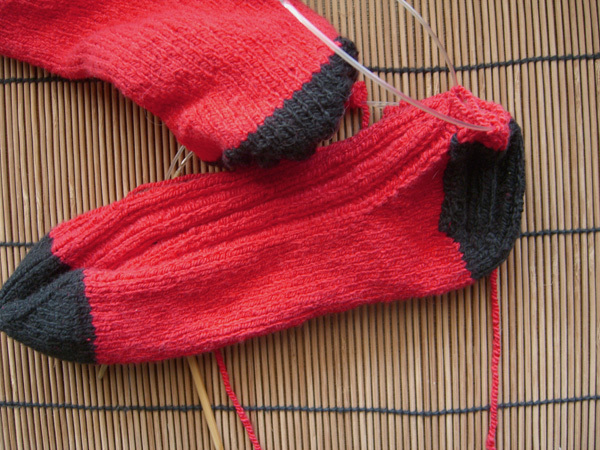 I’ve been hard at work on the red and black Fixation socks. I have turned the heels (black) and I’m heading up the ankles. I hope to have these done very soon. Then I need to finish the Rainbow socks that I’m doing in the stranded pattern. Then it’s on to the Key West. 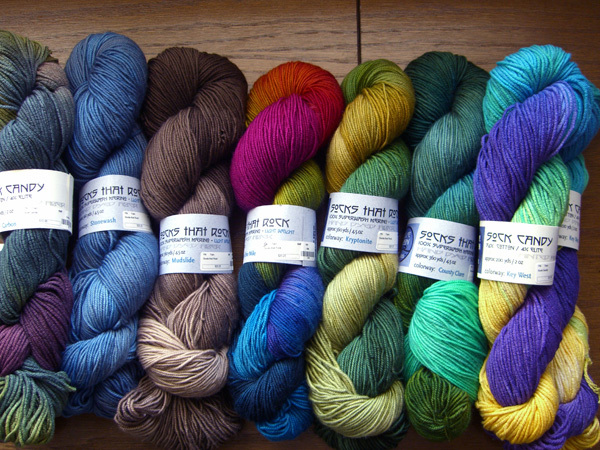 As long as so many wonderful sock yarns are made, why knit anything else?